The first place of eVolo’s 2015 Skyscraper Competition was awarded to BOMP (Ewa Odyjas, Agnieszka Morga, Konrad Basan, and Jakub Pudo) from Poland for their project Essence Skyscraper. The proposal is an urban mega-structure that contains diverse natural habitats. Away from everyday routines, in a dense city center, a secret garden that combines architecture and a nature is born. The main goal of this project is to position non-architectural phenomena in an urban fabric. An inspiration rooted in nature allowed to form a representation of external worlds in the shape of a vertical structure. Overlapping landscapes like an ocean, a jungle, a cave or a waterfall will stimulate a diverse and complex range of visual, acoustic, thermal, olfactory, and kinesthetic experiences. The main body of the building is divided into 11 natural landscapes. This provides an intensive nature experience for city-dwellers, who otherwise, may not have the opportunity to interact with natural environments. 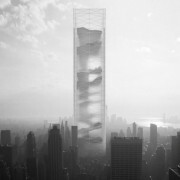 This conceptual skyscraper may foster a sense of enjoyment and responsibility to people who are completely immersed in urban settings. (source).